"I woke up to a terrifying feeling both physically and mentally. My body was motionless and all I can do was feel helpless as I saw a shadowy figure enter my room. As black as night with no facial features and a fedora shaped hat on it's head, this entity roamed around my room until finally approaching me which had me more horrified then I have ever been before. I could barely breath. The shadow being eventually left and I was able to move again". This was not an exact situation that I encountered but one I made up after reading different stories from people who have dealt with these strange occurrences. Thousands of people have encountered these same startling visitations from other worldly intruders known as Shadow People. Shadow people have many variations and can be of almost any height and size and are referred to as humanoids. 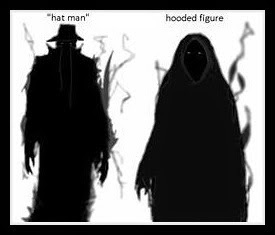 Notable types of shadow people are the hag, the monk, and the hat man. The hat man is the most common of shadow people experiences. Some people view these beings as neutral, even less view them as friendly but most feel that they are malevolent. Shadow people almost always cause fear in it's victims and some experience physical pain or discomfort such as the feeling of being choked or sitting upon one's chest. The night isn't the only time these figures show themselves as many people have witnessed them during broad daylight and in lit rooms. So what are these phantoms that haunt our world and keep people from their sleep? Are they ghosts? Demons? Aliens? Other dimensional beings? Or are they just a figment of our imaginations as well as images that are created from mental and/or sleep disorders? One key to figuring out why many people see these shadows is the sleep disorder, sleep paralysis. According to WebMD, "Sleep paralysis is a feeling of being conscious but unable to move. It occurs when a person passes between stages of wakefulness and sleep. During these transitions, you may be unable to move or speak for a few seconds up to a few minutes. Some people may also feel pressure or a sense of choking". Sleep paralysis is the leading cause of these nighttime beings. They appear there yet its our imaginations that actually create them. Other reasons for seeing shadow beings can be drug use, certain psychological disorders, side-effects of medicines, and even our mind playing tricks on us. These "things" which may seem to cause nothing but a scare may have actually led to the deaths of over two-hundred people during the years of 1982-1990. Sudden unexpected nocturnal death syndrome better known as "SUNDS" is a disease that effects people of all ages in southeast Asia (Wikipedia). This disease leaves people dead in their beds without a clue of why they died. Victims of this disease have irregular heart rhythms and ventricular fibrillation which causes their hearts to stop. Sleep paralysis and "SUNDS" may be linked. People with this heart disorder may function fine throughout their lives but one that suffers from both this heart defect and sleep paralysis can be in danger. Imagine the fear and dread that one would feel when seeing, hearing, and even feeling one of these entities while being helpless. This fear could be intense enough that people who suffer these heart problems can actually be scared to death. We can see some folklore that may seem to exist among these people especially with their extreme beliefs in spirits and evil entities. Most people think of these shadows as evil spirits but some report them as being aliens. Once again, sleep paralysis creates situations that never actually exist yet leave a realistic impression on the supposed victim. Chapter six in the book Scientific Perspectives on Pseudoscience and the Paranormal, has a passage of a victims experience, "I was lying in bed facing the wall, and suddenly my heart started to race. I could feel the presence of three entities standing beside me. I was unable to move my body but could move my eyes. One of the entities, a male, was laughing at me, not verbally but with his mind". The author goes on to say, "Experiences of this kind are most probably explicable as sleep paralysis; a phenomenon that is usually estimated as occurring in approximately 15% to 25% of the population". With sleep paralysis being as common as the statistics show, it seems that this explanation for shadow beings can close the door on people looking for reasons to think that this paranormal phenomenon truly exists. I have a friend who, when extremely sleep deprived due to his job, claimed to have seen these 'shadow people'. Its interesting to me that many people seem to share the same hallucination under certain conditions. Yeah and in all areas of the world as well. Even though I have never experienced the horror of seeing any of these "Shadow People", I have suffered from sleep paralysis on two separate occasions. Both times I was laying in bed, once in my actual room at home and the other in my dorm room at school. Just like you said in your post, I could not move any part of my body, yell, scream, or even talk, the only thing that seemed to be moving were my eyes. Even though it felt like they were blinking extremely fast, I could tell that out of one eye I was focused on my actual room, however, the other eye was focused on whatever dream situation I was in. It may have only lasted what I think was a long few minutes, but it was still a pretty scary thing. It is really interesting to read how several hundreds of people have died from something that may be connect to sleep paralysis. Personally, I think there has to be a link between the two, especially if I found it scary and I didn't even see any of these "Shadow People".